November 24th marks the one year anniversary of the world wide launch of Star Wars: Galaxy of Heroes. On behalf of the entire team here at Capital Games, we want to thank you for playing the game and for your continued support. Throughout these past twelve months, we’ve been humbled by how millions of people around the world have responded to the game and helped to make it such a success. Having a chance to work on a game based in the phenomenal Star Wars universe is a true honor, and one we take to heart. Over the past year we’ve added a lot to the game: Guilds, Raids, Mods, Tournaments, new characters, new events, new activities. 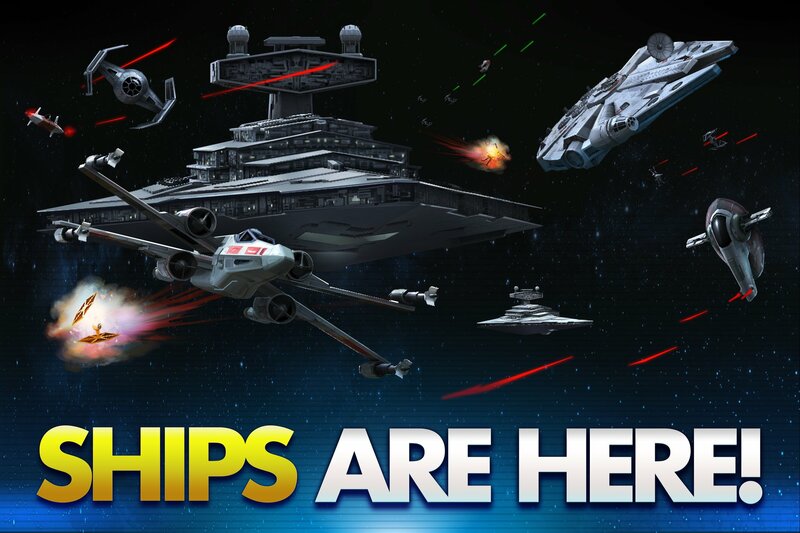 With the update releasing today, we are bringing forth our biggest update the game has seen: Ships! Please note that some of these changes are already live, but not all of them will be. As with previous Updates, this may take up to 48 hours to fully roll out to all players. Once the update is available in your region you can manually download it from the App Store or Google Play Store. Thanks! We hope you and the entire player base love it as much as we’ve loved creating it. The ability to collect and do battle with ships is not only a massive content expansion to the existing game - it’s another huge step toward fulfilling the fantasy of playing a strategy game that includes all of Star Wars. Like the rest of the experience, one of our pillars was authenticity. We wanted to get as close as possible to the feeling of crewing iconic ships with iconic characters - ultimately bringing more gameplay value to collecting your favorites of either type. And in combat, each ship’s ability set has been crafted to acknowledge what makes them unique - just like we do with characters. We also designed in a way to honor players' engagement in our existing systems, and in a way that would connect both ships and characters. The progression of a character’s star rating is acknowledged in the ship abilities unlock path. And investing in the ship’s star rating brings even more of the crew’s power over to the ship. Increasing a character’s power increases their Crew Rating, and that directly translates into Ship Power. And because of the many players invested in our game, another pillar was familiarity. In trying to respect the schemas that players already understand: acquiring a ship is like acquiring a character, progressing a ship is like progressing a character, setting up a fleet is like setting up a squad, Fleet Commander are similar but not identical to leaders, and squad strategy is similar but not identical to fleet strategy. Going back to our original goal of the experience we wanted to bring to players - that has always included ships. And with ships now a part of Galaxy of Heroes strategy, we have a whole new facet of the Star Wars experience to build on in future updates. The Cantina home screen has been rearranged slightly to make room for the entrance to a new room dedicated to Ships. To access the room a player must be level 60 and complete a series of Fleet Commander Events. Starting at level 25, players can access a series of special (and free) Events that will reward enough crew and Ships to take part in Ships combat. Additional Events will unlock every few levels leading up to Player Level 60, when the Ships room is available. Players at Level 60 or above, will be able to play through each of these Events sequentially. Activating and upgrading ships will also be familiar to players. However, ships are tied directly to their crew members (these Ships can’t fly by themselves). At level 25, a player will see an introduction to the Ship Inventory. A new button will appear on Cantina Home screen to access it. And once the main ship area is unlocked there will be another avenue to access the inventory there. Ship details will give players all the info on each ship. Tapping on a ship’s crew member portraits in the details will bring the player to that character’s details page. The key to making a Ship stronger is to improve its crew member(s) and improving the Ship itself. Crew Power: The biggest contributor to making a ship stronger is to invest in its crew member(s) including character level, gear level, stars, mod rarity/level, and ability level. Ship Upgrading: Increasing a Ship’s Star Rarity is a direct multiplier of the Crew Power and can reach a multiplier of 1.5 at 7 Stars. Once a player has unlocked the Ship Inventory, all crew member characters will have buttons in their details that link to the ship that character is associated with. Players can easily navigate from a ship to its crew member(s) and back again. Once you’ve secured your right to walk into the ship area players will be met with the central hub for all things that have to do with fleets in Galaxy of Heroes. Tables for ship-focused areas are arranged on the room floor, complete with a band! The Fleet Arena is where players can prove themselves battling against the starship might of other players. Players that know the Squad Arena will find the Fleet Arena to be a comfortable place to play. Fleet Arena will not have the exact same leaderboards that Arena does. The players you face in Arena started playing the game at roughly the same time as you did, meaning there could be very large gaps in power. Fleet Arena leaderboards will be composed of the teams efforts to give players an even playing field. And always remember: The power of crew members is vital to the power of a ship! Zeta Materials: A new ability material that is a component in unlocking new ability levels for some characters. See lower in this post for more details. Squad Arena Store: Prestige, a new ability material that is required for Capital Ship Ability leveling has been added. A new squad tournament debuts next week! Battle against other Galactic Champions to earn blueprints needed to acquire Darth Vader's personal ship – the TIE Advanced x1! This tournament is for Players level 30 or above. Just as you would level up your character with XP Training droids, you can also level up your collection of ships with enhancement droids. Choose between either the small pack or the mega pack to power up your fleet. Please note the minimum Player level to access these packs is 60+. This new material can be found in Fleet Arena Shipments and Fleet Commander Events. Here's the current list of characters that have new levels of abilities requiring Zeta materials (and other ability materials) as a component. Boba Fett now starts each battle with "Bounty Hunter’s Resolve." This buff can't be dispelled, allows him to ignore Taunts, and causes him to revive upon defeat. He regains “Bounty Hunter’s Resolve" each time he defeats an enemy. "Execute" is now a special ability that dispels all effects on the target and will prevent them from being revived. In addition to upgrades to his existing skills, he's gained a new, often requested ability: He now fires his EE-3 Carbine Rifle!" Fixed an issue where the Squad management slots were not auto-filling correctly.